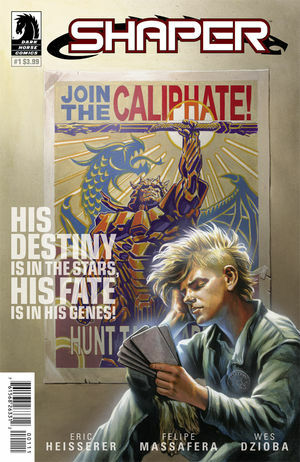 This coming Wednesday, Dark Horse debuts Shaper, written by Eric Heisserer and illustrated by Felipe Massafera. In a universe with future armies working on eradicating a race of shapeshifters, Spry is an orphan looking to find his future. You’ll likely guess the big first issue reveal, just from that description (and if not, it’s in the publisher’s description at that first link). The world building is solid and thorough, if there’s a bit too much narration in this first issue to set it all up. The character voices are varied, although it’s tough to get to know much about many of them in this short intro. Personally, I’m not interested in the story of a young wannabe soldier becoming a man — it’s just not to my taste, since I’m looking for stories that better reflect my experiences, not macho stereotypes — but others will enjoy the science fiction action and the classic themes used here, including the downfall of hero worship when contrasted with real life and the search for the father.